The many unique animals that inhabit the Avatar World. Gigantic creatures that can Earthbend, they were the teachers to the orignal human earthbenders, Oma and Shu. They are found in the wild and occasionally used by people/organizations. Stylized statues of Badger Moles can be found at the entrance of some Earth Kingdom cities. Yes folks, it's the latest trend in feline style; the long mustache and beard combo clearly convey "wise but full of attitude". Also, be sure to keep your cats away from lemurs, otherwise you're just asking for trouble. Such a pretty and friendly butterfly... but considering its bright colors, it's possible that it's poisonous or at least pretending to be. But unless you're a hungry bird or lizard, such warnings can go unheeded. Found in the Great Divide, the largest canyon in the world, these giant ant-like creatures fit right at home in the many cracks and passageways in the canyon walls. They have 8 red eyes, an insatiable hunger, can scale 90-degree walls with ease, and are quite dangerous. A tiny flying insect that can glow because of a chemical reaction inside its body. Probably found in the forests below the Northern Air Temple; they're kept by the hundreds inside lanturns for use as a non-flamable light source inside the temple. "Flopsie" is actually its nickname; its specie is... undecided. ^^; It's a unique hybrid; gorilla face and body, rabbit ears and speed, goat back legs, tail, and horns, yet acts like a bulldog. Flopsie is huge (that's Aang in his arms), has green eyes, and loves to have his belly scratched. Flopsie is King Bumi of Omashu's pet. A type of bug found in the Earth Kingdom forests, as seen in episode 10. Its size is medium-small; roughly fitting into Momo's "hands". Similar to a large beetle. A large green fish that loved to taunt Sokka in ep14. 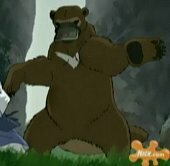 And judging from its size and smirky attitude, Sokka isn't the only one who failed to catch and eat this fish. ^-^ It has a blue and dark green stripe running down its sides, and catfish-like whiskers. Mentioned many times, but first seen in episode 10. These large monkeys have red eyes, auburn fur on their upper torso, dark brown fur on their legs and tail, and a dark brown mask pattern on their face. Very wild and hate to be ridden on. A longhaired cat found in the northwestern region of the Earth Kingdom. This is Miyuki, owned by an elderly herbalist in an abandoned city. Plum blossoms are one of her favorite things to eat. A fuzzy little mouse that lives in the forests. They're probably very common in most areas (being mice and all), and make the cutest squeaky sound. ^-^ They're pretty friendly towards people, too. A large bird/horse hybrid is used by the Earth Kingdom to carry people. Those used by the military wear armor on their head, neck, and lower legs. They are rather tamable, but can startle easily. Found in the northern region, the Platypus Bear has brown fur with a white "V" crest across its chest. They also have a bill inlined with sharp teeth, furless webbed feet, and a wide flat tail. They lay large eggs, and can be fiercely territorial. Your typical long-eared rabbit; white fur, fuzzy cotton tail, adorable beady eyes, and ears that are almost an inch or two longer than the full length of its body. They are also incredibly fast. A beautifully hued bird found in the Earth Kingdom wild. Has vivid red plumage with maroon tipped wings, and two ribbon-like feathers that flow from its fanned tail. An almost identical-looking bird is used by the Fire Nation as Messenger Hawks. Part lizard, part bird. 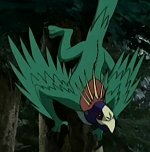 Has green feathered wings and tail with blue feathers underneath, has four legs tipped with four sharp claws, and yellow scales running down its back. This bird can climb trees and fly, and is kept by, who else, a pirate captain. What's a canyon without some scorpions, right? These desert arachnids like to hang out under rocks and buried under the sand, and usually come out at night. They have two big pincer claws, and their trademark tail provides a venomous sting. Definitely not one of the friendliest hybrid insects ever, these flying scorpions often travel in large packs. However, it is said that if you don't bother them, they won't bother you. But if you find yourself in trouble, smoke will calm the bees down. Shirshu is a large wolf-anteater-mole hybrid, and is kept by the bounty hunter Jun. Shirshu is blind, but can "see" with it's very powerful (and scary looking) nose. It is very fast and extremely strong, and is capable of peeling away solid steel plating with its teeth. Along with sharp claws, Shirshu also has a long, thin tongue with a barbed end that can paralyze its prey instantly. Usually seen inside a village below Mt. 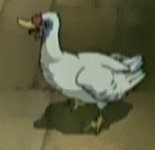 Makaku, these large fowls aren't afraid of people, but aren't tame either. While they can fly, they seem more content to walk on the ground and cluster in groups. They make a low quack/honk sound, and will attack if provoked. They are similar looking to the real-world Muscovy Duck. Found in the northwestern region, these frogs live frozen in the mud on the bottom of valley swamps. Their skin secretes a substance that can cure certain illnesses when sucked on, but only while frozen. Once they thaw out, they're just a regular frog.